Odd Socks and Random Thoughts | A blog about anything and everything. A blog about anything and everything. Halloween is awesome. What’s not to like about unlimited candy, being scared shitless, and the impending hangover from mixing alcohol with all that candy. Life is good. However, it can also be a great time to get some spooky skeletons out of your closet. 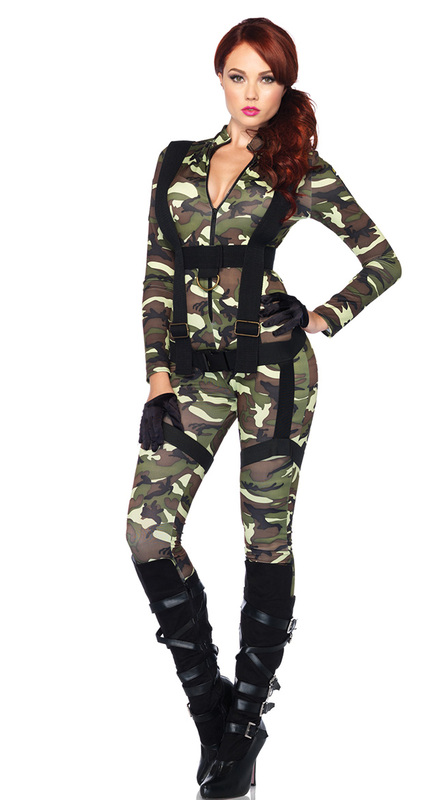 If planned properly, it can be the perfect opportunity to tell your significant other that you want to go as something different this year: single. 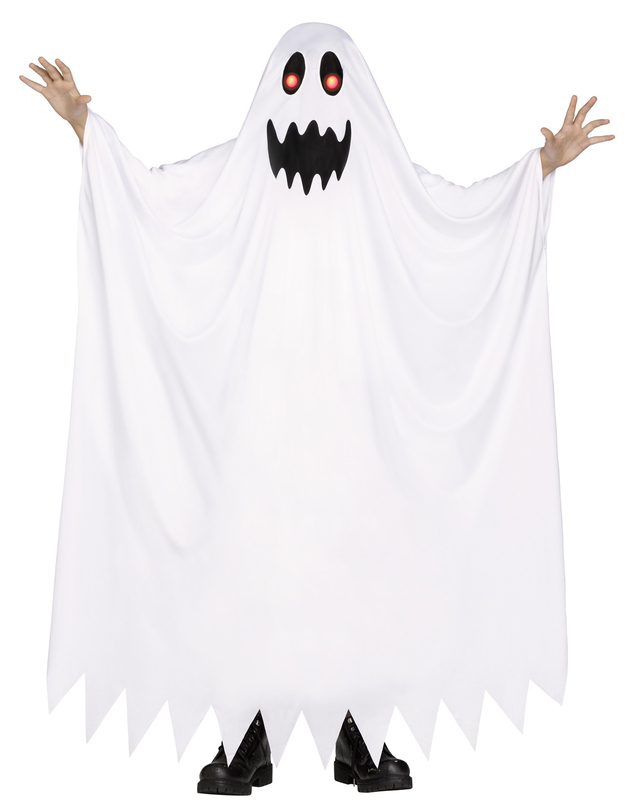 Here are the top costumes for your impending breakup, and the corresponding punny explanations to help lighten the mood a bit. My guess is one of these may or may not be used on me come Monday…I need to stop giving Darby ideas. Let’s be honest, work isn’t always sunshine and rainbows. Sometimes it’s long. Sometimes it’s boring. Sometimes it’s hectic, and sometimes it’s just downright awful. Having had experience in both the office world and the customer service world, I’ve had more than my fair share of “down time”, where it seems as if the clocks are painted on and the sweet glorious taste of freedom is simply unreachable. Every now and them, something amazing can happen. Like doing the water bottle flip challenge, 3 times in a row. No big deal. During one stint at the workplace where time (and productivity) was basically at a standstill, I asked myself, “How can I entertain myself, and potentially others?”, which is how I decided to build an imaginary group of fellow employees to keep me company using Snapchat. This was a particular period in time where most of the other staff members were on break, so with an empty office I had no choice but to be creative. Who said you couldn’t have fun at work?! Note: All of these snaps were made while on break. I would never use company time to create such a masterpiece! (or snapsterpiece). So after a very successful polling session, with a grand total of 57 votes, we have discovered the gender and name of the giraffe! I hired a bunch of people for the big reveal. So now we move on to the next part of the story: Where was Lily born? Was she brought up in captivity? Was she born in the wild? Was she brought up by a couple of Hyenas? That’s where I need you yet again, readers, to come up with an origin story! Again, I’ll be setting up a vote, where you can either choose an option or come up with your own idea! I want you all to be as creative as possible, the more outlandish the better! You may or may not have noticed, but there is a new button on the header menu, right next to “About Andrew”. The “About the Giraffe” page is exactly what it sounds like; it’s a page which will include a whole bunch of information about the giraffe pictured at the top of the page. Unfortunately for me, this page is going to be way more fun and interesting than the “About Andrew” page. The reason for that is because YOU the reader will be helping me come up with the giraffe’s personal characteristics and story! 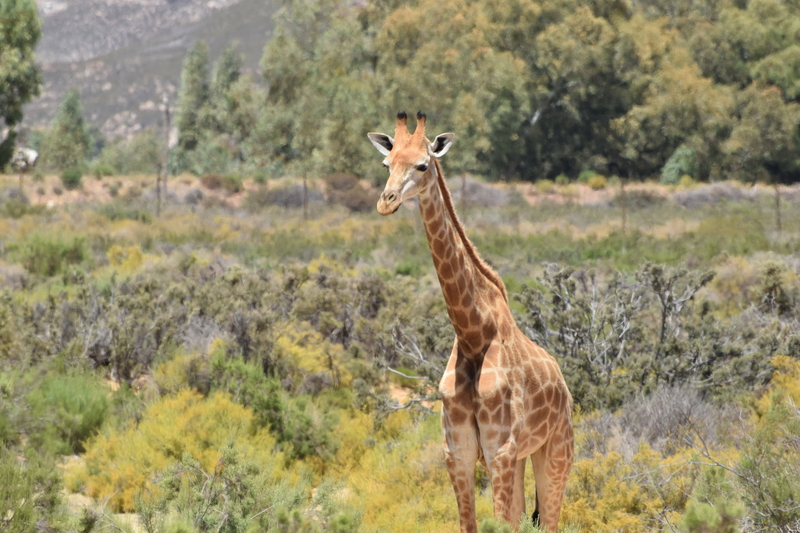 So far I have put it up to a vote for people to decide if it is a male or female giraffe, and if so, what it’s name is. Voting is still open, but I will close the polls on Monday, May 30th at midnight. AS OF RIGHT NOW (as I said, voting is still open! ), the giraffe is a female named Lily! The next step will be to come up with where it came from, and how it was raised. I will post an update as soon as voting closes for the first step, and I will open things up yet again for all of you to have your say. So by all means, keep on voting for what you’d like he/she to be called, and feel free to invite your family and friends to share in this journey! There’s only a few days left and I’d like to get as many people on board before we move forward. Happy polling! With a Canadian federal election quickly approaching on the horizon, each national political party is being put under the microscope. Whether it’s about party policies, the state of the economy or climate change, not a single stone is being left unturned. Except perhaps the “page not found” pages on their websites. The 404 page is one we barely give a second thought to, except to say “Oops, I took a wrong turn.” and then move on in mere seconds. It’s an afterthought for most of us, but the political parties took the time to come up with unique, clever and sassy ideas for theirs. Now even though I am a committed (insert your political affiliation here) like you, we’re going to put that aside and look at these pages together. The Conservatives got on the “bashing Justin Trudeau” train early, putting out ads before the election campaign had even officially begun. They have been using the “Just Not Ready” mantra consistently, questioning whether young Justin has what it takes to run a country. It is a clear low-blow towards Justin, but it’s a damn good one. If you’re going to take the time to be clever, might as well do it at an opponent’s expense. Props to the Conservatives on this one. The NDP decided to take a shot at the current Prime Minister. Along the same lines as the Conservatives, the NDP came up with a link (pun intended) between a broken link and a broken Conservative plan. Again, clever but ice-cold. I love it! The Liberal Party of Canada went with a 404 page to adhere to the younger audience, coming up with the most Canadian version of the well-known Fail Whale on the Twitter 404 page. Without taking any shots at other political parties, the Liberals were able to be clever at no one’s expense. Being able to include Canada Geese and a Moose on your page is always a bonus. The Bloc Quebecois did not have a 404 page, as any broken links simply went to the news page. Personally, I find all of these pages great. Even if you think they might be cheap shots at one another, I would argue that these are attempts to at least get the younger, more internet-savvy voters to take even the slightest bit of interest in politics. If even one of these 404 pages made someone laugh or go “Oh snap!”, then they have accomplished a very difficult task; making politics interesting (note: this is something I’ve already written about). Note: Writing this article made me realize how hard it is to find a Canadian flag to take a picture of. Fellow Canadians, we need to get more patriotic! When many people hear the word “politics”, their eyes start to glaze over and a bit of drool drips out of their mouth. People are simply uninterested in what’s happening on Parliament Hill (for my non-Canadian readers, insert federal government’s office here). Too often, it’s either an issue unrelated to you, or it involves an ridiculous amount of big words that you need to spend the next four hours researching. Short of having a Political Science degree, chances are you will have trouble understanding something you don’t really care about. I see why a lot of people don’t invest in learning about politics. The problem is that we should care. When elections come around, how do we know who we are going to vote for? Will we even vote? The first time I voted, I’m pretty sure I decided who I would vote for based on who had the coolest name. I had so little knowledge of what stance each party was taking on the big issues, and this stopped me from being able to make an informed decision. The only reason I learnt anything was because I had interview Members of Parliament while working as a reporter at the Gazette Vaudreuil-Soulanges. At the last federal election, six out of every 10 Canadians used their right to vote, and that number was much lower for people aged 25 and under. I’m right on that bubble at 24, and I know countless people from my high school who didn’t vote. It may be that they don’t have confidence in any party, or that they don’t know enough about each party’s platform to make a decision. It may even be a silent protest, using their non-vote as a statement. Whatever the reason may be, there a lot of youngsters who aren’t making their voices heard. There is no way to elect a truly representative government if that many people aren’t voting. It is a problem that has gotten worse at every election. Why is that? Is it because the system doesn’t work? Have people, especially young people, lost confidence in Canada’s political system? Or is it people are not getting the information and understanding required to make an informed decision? High school history professor Mario Bissonnette has been trying to fix the problem for years. Bissonnette, a graduate of UQAM and Université de Sherbrooke, has worked in the education sector for nearly 25 years as a teacher and vice-principal. 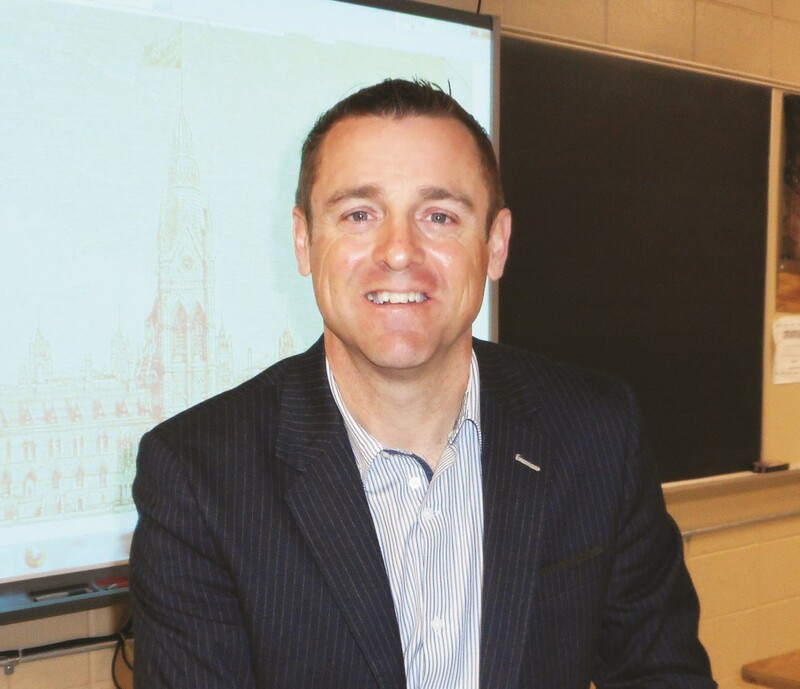 For seven years he was a jury member for the Governor General’s Award for Excellence in Teaching History and a member of the Library of Parliament’s Teacher Advisory Committee in Ottawa. Bissonnette believes in involving youth in the democratic process, and he does so by organizing Youth Parliaments and ensuring his school sends a delegation to the annual event in Quebec City. At the event, they spend several days debating in the National Assembly and learning democratic procedure. He has organized mock elections in Commission scolaire des Trois-Lacs and Lester B. Pearson School Board high schools in his region. Getting the youth involved in politics is Bissonnette’s main goal. He is very concerned with the cynicism that young voters or to-be voters have towards politics. Through education and participation, he believes that the youth will have an invested interest in being involved in Canada’s politics. “I think not getting the youth involved is a mistake. If people get involved, they can make a huge difference. I took a Political Science class this year called “Introduction to Canadian Politics”. I learnt more about the way our country is run in that course than I did in all of my University, Cegep and high school classes combined. I find that concerning. When I turned 18 and was legally allowed to vote, I had no idea what I was doing. I simply voted for whoever had the coolest name, or who my parents were voting for. It was almost as bad as not voting, because I was not making a decision based on policies or ideologies I believed in. Bissonnette is attempting to get his students actively involved in politics, in the hopes that they will get to the voting age and have a basic idea of what each party stands for and who they would like to vote for. When I think back, I wish I had learnt more about Canadian politics, so I could have properly contributed as a voting citizen when I was of age. I’m sure high school me would hate that I am suggesting more classes, but it’s information that would actually benefit in the future. I wasn’t making informed decisions in my voting until I was 22, after forcing myself to learn a bit about each party and their stance on certain issues. I believe initiatives like Bissonette’s will help lower the amount of young voters who get to the polls without a basic understanding of how the system works. I think it’s very important to teach people about politics as soon as possible and to demonstrate the importance and impact of being involved in the process. Democracy only works if everyone is using their voice and are informed about the issues at hand. That is what we need to strive for. What do you think? Should we teach teenagers in High School about the political system? Vote below. Unfortunately, this will not be a happy post with my usual cheery demeanor. I wasn’t sure whether to write about the topic, but the recent events involving Walter Scott and Michael Slager in South Carolina have hit me harder than I expected. When I saw a link to the video a few days ago, I never thought it would strike me as hard as it did. We have become so desensitized to violence in the media to the point where seeing shootings on television are almost surreal. This video was as real as it gets, and it was chilling. Reading this brought me incredibly sadness. The fact that someone I know and love feels that there are people who consider his life less valuable tore a hole in my heart. The United States does indeed have a problem with racism. It seems like only a few weeks ago that the public was up in arms after Darren Wilson shot Michael Brown in Ferguson. We now have a video of another unarmed black man being shot in the back. These events fall onto a long list of deadly shootings of black men by police officers. It is a nail in the coffin for any argument that race is not an issue in the country. The problem with the race issue in America is that it cannot be changed with new policies and procedures – it is embedded so much deeper than legislation. We have seen with gay rights in America that even when the laws change, the social stigmas do not. No matter what policy changes may come from this incident (if any), it will not stop people from abusing their powers in a discriminatory fashion. To be clear, I don’t believe every police officer is racist, just as I don’t believe every back person is innocent (or white person, or hispanic person, or asian person). I also realize that there are black people who are being killed at the hands of other black people, which is equally problematic. What I do believe is that there are far too many incidents between black men and excessive force being used by police officers to mark it up as “normal”. The law is supposed to be colour-blind, yet it is clear that this is not so. There is a culture problem deeply rooted in history which must change. Unfortunately, it often takes a tragedy like Walter Scott to spark social action. What is important is that we do not stop fighting for this change. Too often there is a massive public outcry after a tragedy which is then followed by deafening silence. A few weeks after the Sandy Hook Elementary School shooting, there was silence. A few weeks after Michael Brown was shot, there was silence. We can no longer allow for this silence to settle. We cannot let Walter Scott fall into this same silence. Without a continuous and relentless fight for change, change will not come. My beautiful fiancée Erika and her haflinger Oliver. I have been their (un)official show groom for years. The life of a competitive horseback rider involves sacrificing both time and energy to be successful. My now-fiancée Erika has been an avid rider for years, and after nine years of being together, I have become a big fan of equestrian activities. For anyone who has not tried it, I can tell you with utmost certainty that it is much, much harder than it looks. Recreational riding is challenging enough, but riding competitively in horse shows brings it to a new level of difficulty. As the summers of horse shows went by, I played a bigger and bigger role in Erika’s horse shows. 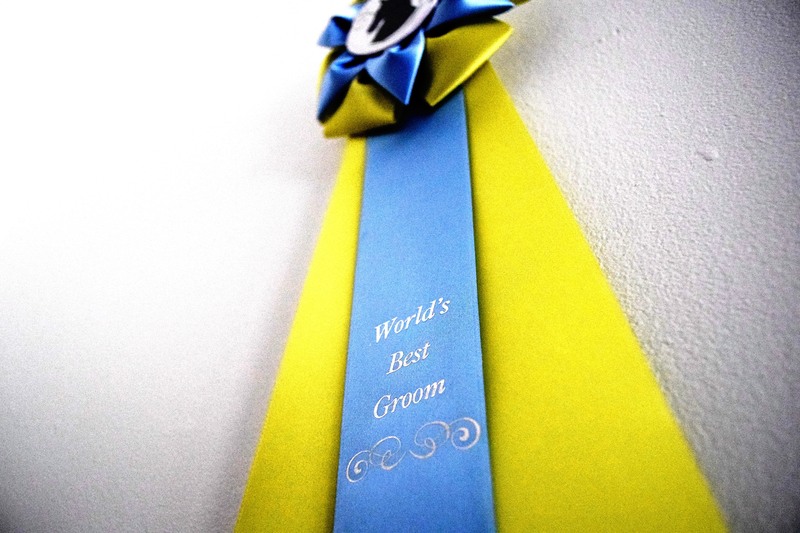 After hours of unofficial training, I eventually became useful enough to be granted the title of show groom. A show groom helps their rider with the everyday tasks during a horse show. These responsibilities include cleaning tack, brushing dust off of their boots, making sure the horse is perfectly brushed, and helping the rider recuperate after a difficult ride. 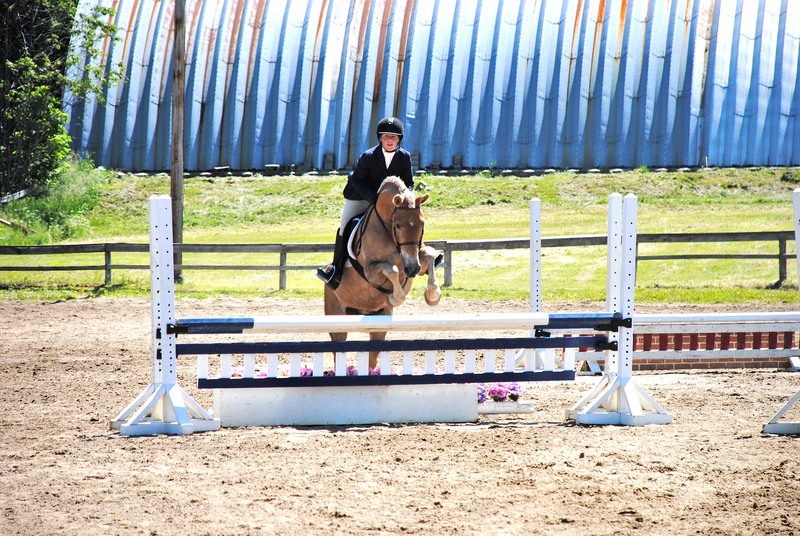 The shows involve jumping over obstacles, which can be both stressful and exhilarating at the same time. After so many years of working together, I have picked up some important key tips for being successful. I will soon be watching my beautiful soon-to-be wife walk down the aisle, and I will remember the lessons I learnt as a show groom. Here are the five key tips I have picked up over the years. If horse shows have taught me anything, it is that communication is what leads to success. Horse shows involve a lot of running around, figuring out who is riding at what time, if they have qualified for a second run, where the coaches are, and so on. It is important for the groom and the rider to be on the same page at all times, making sure they both know what responsibilities each has covered and if either of them need help with their tasks. It is better to communicate any problems or issues and work through them together than to stay silent and fail. What is a horse groom without a noble steed to brush? What is a rider with disheveled horse? The answer is simple: inadequate. A groom and rider need each other to be successful at a horse show. 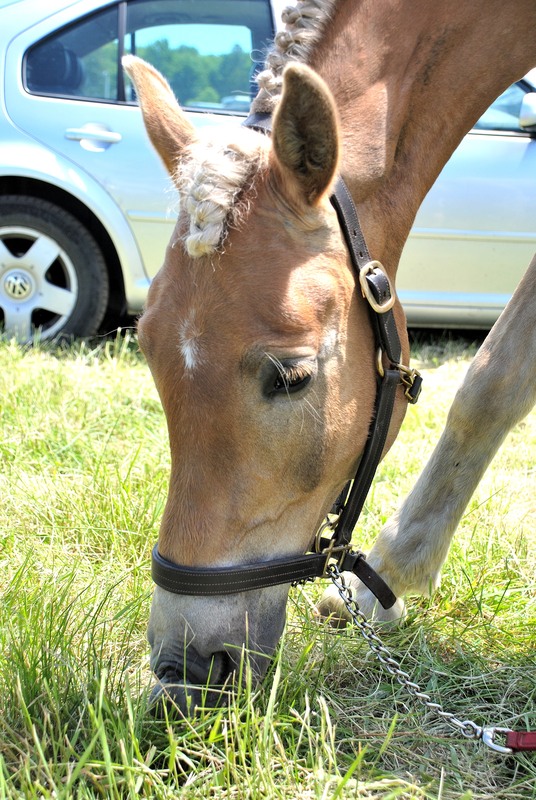 The rider needs the groom just as much as the groom relies on a rider for a job. Teams rarely get far if the parties involved are not working together. Supporting one another is vital for any team to thrive, and it is just as important to ask for help when you need it. Most obstacles are manageable when people are working together. The horse is the most important part of a horse show, but the rider and groom are necessary pieces to be successful. I am not going to sugarcoat things; horse shows can be very stressful. There are thousands of different things to worry about throughout the day, and when things don’t go as planned, tempers may flare. I don’t always work well under pressure, and when there are too many things happening at once, I tend to shut down. This can be incredibly aggravating for the Erika and all parties involved. The one thing I have learned is that anything said in the heat of the moment needs to be water under the bridge. No relationship is perfect, be it between a rider and groom or a bride and groom. What is important to remember is that when the waters get rough, it is teamwork and forgiveness which keeps the ship afloat. Getting worked up over the little things takes up a lot of energy, which in turn takes its toll on a relationship. Let things go, and move on. Whenever I leave a horse show, I always leave the negatives behind. I make a point to remember the how pleasant horse shows can be. What isn’t there to enjoy about being outside on a sunny day, sitting in a field with a light breeze in the air and horses in the distance. I think about the smile on Erika’s face when things go well, and the love she gives to both the horse and to me. I also think about how when things don’t go well, she comes to me for comfort. Anyone who has been in a relationship will tell you that they are a roller coaster. What is important to remember is that there are positives in every situation. At times, things can get rough. The important thing is to learn from mistakes and build for future success. Even though teamwork can help the rider and groom get over some obstacles, things don’t always go smoothly. 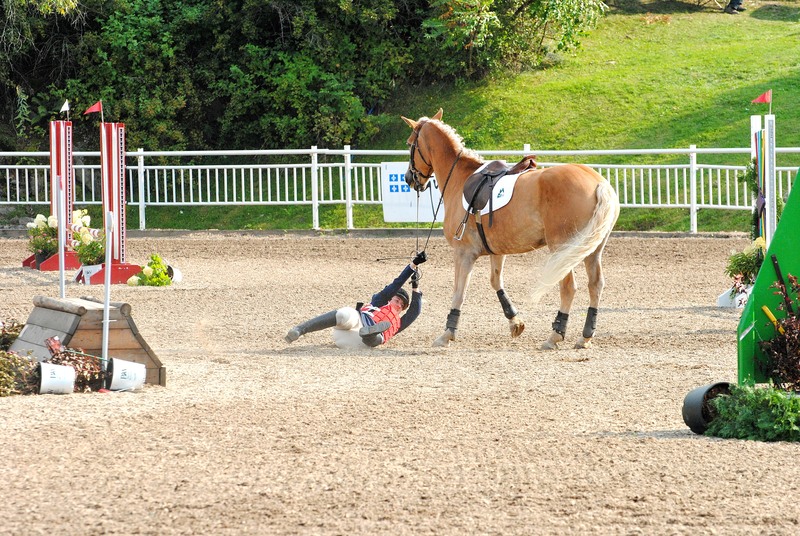 Horses spook, riders fall, and distances are miscalculated. Sometimes, the outcome can be downright awful. What the rider and groom takes from these experiences can be used to help build a better future. It is important to remember that failures can strengthen a relationship, but success should not be overlooked either. All of these tips have helped build a very strong bond between Erika and I. We will soon enough be starting our lives together as husband and wife, and we will move forward taking what we have learned as rider and groom to get through anything life throws our way. Working as a team can get any couple through troubling times. Relationships are never easy, but remembering that you are both on the same side can make a world of difference. Surprise! It’s April, and there is still ice and snow plaguing driveways everywhere. It’s time to take action! This is not a post about breaking the ice and being a hit at your next social event. This is a post from a disgruntled Canadian who is sick and tired of ice and snow. Recently, the weather has been improving. This has helped me step back from the ledge and assure myself that better times are ahead. Unfortunately, the ice and snow continues to stick around as a constant reminder that winter hasn’t thrown in the towel just yet. My driveway is a particular problem, as it is in the shade for most of the day taking months for it all to melt. 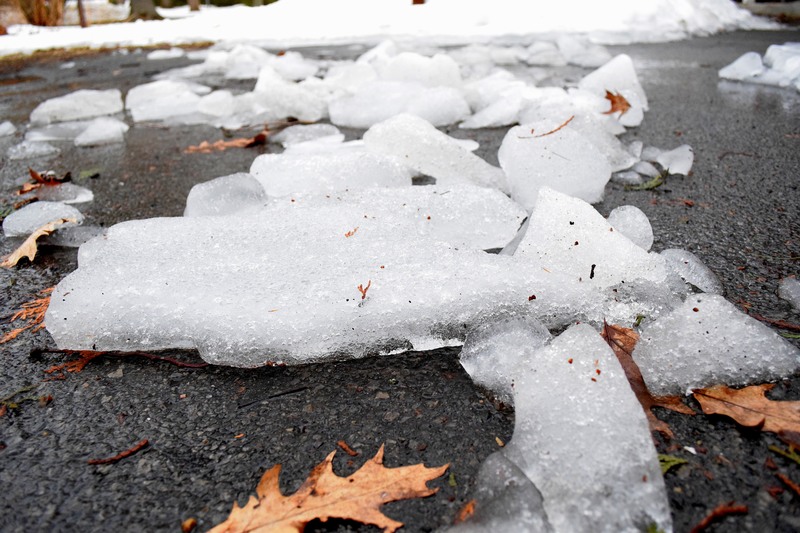 Here is a list of my four key tips for getting rid of the ice on your driveway faster. 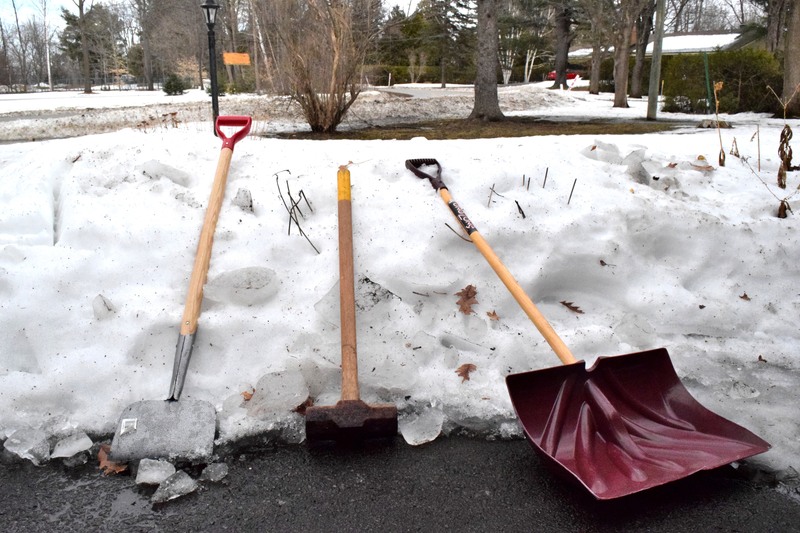 An ice chopper, a sledgehammer and a shovel are the tools you need to successfully break ice. All of these items can be picked up at your local hardware store. It is very difficult to have any sort of success breaking ice without these tools, unless you have a tractor. If you do have a tractor, then why are you reading an article about breaking ice? It should be a no-brainer! The strategy I use is the ice chopper on the edges until the ice gets too thick, then you smash it with the sledgehammer. Once it’s all broken up, shovel it all away into either your yard or sunlit driveway, where the heated pavement will melt it all away. Another strategy is the Hulk-smash, where you simply hit the ice until you’re either out of breath or pass out from exhaustion. I wouldn’t recommend this strategy, as it is a huge waste of energy. Your goal is to aid the natural course, not obliterate it. Salt is nature’s defense for ice. Put down as much salt as you want, and leave it for a few hours. Worst-case scenario, this will soften up the ice to make it easier to smash. Salt is another item that can be picked up at your local hardware store (I should start promoting them for a profit! ), and they will be on sale this late in the season. Act fast and go pick up a couple of bags. This is a desperate strategy, but it can pay off if the temperature stays high enough. Get the ol’ hose out (stop snickering), make sure the nozzle is spraying a hard stream (I said stop snickering!) and cut away the ice. Once you have broken the ice into chunks, you can then shovel it away like you would after smashing it into pieces. Just make sure that it is supposed to stay above freezing that night, or else your driveway will turn into a skating rink in a flash. Definitely don’t invite grandma over that night. There you have it; four tips to help you break the ice! Remember to bookmark this post and come back to it every spring in the coming years. Or move to Florida. Either option works. Can't be bothered to keep coming back to check for new content? Sign up below, and you'll be emailed any new posts! One of my favourite people in the world - my old man. My dad Alan was diagnosed with Parkinson’s about 10 years ago, but it hasn’t stopped him from being an incredible father and an inspiration to his kids. He has been a huge help in making this dream of a pro shop a reality, from handyman tips & tricks to slogan ideas to lending me furniture for the shop. I caught him watching a practice the other day, and it warmed my heart to see him completely at ease, where we could both forget about his illness for just a second. Thank you, dad. I couldn’t have done this without you.